Molton Brown has launched Muddled Plum, a new limited edition fragrance. Celebrate the festivities with merry muddlement; intoxicate your senses with this limited edition eau de toilette featuring notes of saffron, plum and oak-aged rum. Additional notes include orange, elemi, davana, sandalwood, benzoin and musk. 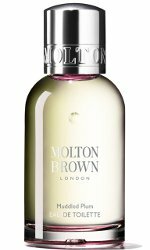 Molton Brown Muddled Plum is available in 50 ml Eau de Toilette and in matching home, bath and body products. Thank you for this post, Robin, I’m quite sure I’ll try it – I do love plum in scents, and rum too – three others, Rosa Absolute, Ylang-Ylang, and Intoxicating Davana Blossom are in my collection.